Opera continues its trip across various platforms as its Opera Mini browser app has just been approved by Apple. Expect the Opera Mini app to make its appearance in the Apps Store anytime now. Depending on your iTunes, setting the Opera Mini app will be available for free download within 24 hours. It comes as a surprise that Apple approves the Opera Mini browser since it will definitely compete with Apple’s very own Safari browser on the iPhone and iPod Touch. But it just shows how open Apple is when it comes to competition, although I’m pretty sure that the Opera Mini is not the first approved app which directly competes with an Apple service. 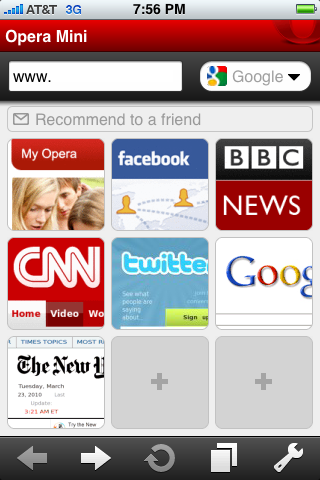 So what does the Opera Mini app brings to the iPhone/iPod Touch table? A couple of good features actually topped by its fast mobile web browsing capability. Credit should be attributed of course to Opera Mini’s compression of web data by up to 90% before sending them to the iPhone/iPod Touch. This results to faster page loading. Opera Mini will be most useful if your iPhone is running on slower networks such as 2G EDGE. It works great with iPhone 3G and 3GS models and would save you some precious data charges when browsing the web using your iPhone due to data compression. Alright, I know that you’re probably grown tired of using the iPhone/iPod Touch’s Safari browser. Time for a cool change. Check out Opera Mini for iPhone/iPod Touch now. You may also want to watch a short video demonstrating the features of the Opera Mini browser on iPhone (check out the video after the jump).